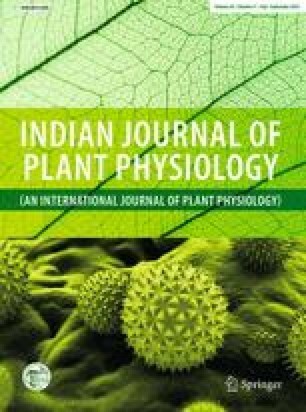 Oil content and fatty acid composition were studied in developing seeds of Pongamia, at intervals of 30 days starting from 45 days after anthesis up to 255 days after anthesis. The oil content increased from 15.96 to 36.93 % as the seed matured. A significant variation in fatty acid composition of the oil was detected during seed development. Proportion of all fatty acids except oleic acid decreased during seed development. Palmitic acid (16:0) content decreased from 22.4 to 10.37 %, while stearic acid (18:0) content decreased from 9.43 to 4.26 %. Linolenic acid (18:3) content decreased from 11.95 to 2.24 %. A sharp increase in linoleic acid content from 28.8 to 41.49 % was observed at stage 2 which decreased afterwards to 17.72 % at maturity. A steady increase in oleic acid (18:1) content from 27.69 to 61.34 % was observed. The saponification number and iodine value decreased, while cetane number increased during seed development. The authors sincerely acknowledge the funding received from the Department of Science and Technology, Government of India. Shyam Sundar Sharma thanks Council of Scientific and Industrial Research, Government of India, for providing fellowship for this work. We thank Dr. Y. S. Sodhi of The Centre for Genetic Manipulation of Crop Plants, University of Delhi, for his kind help in fatty acid profiling.